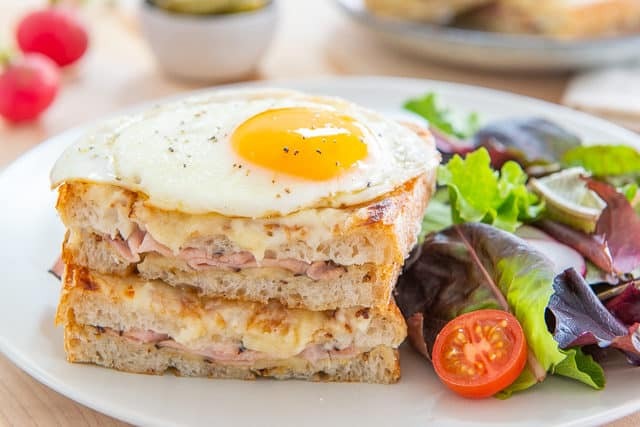 Think of Croque Madame as the French equivalent to the American grilled cheese, but even more delicious! 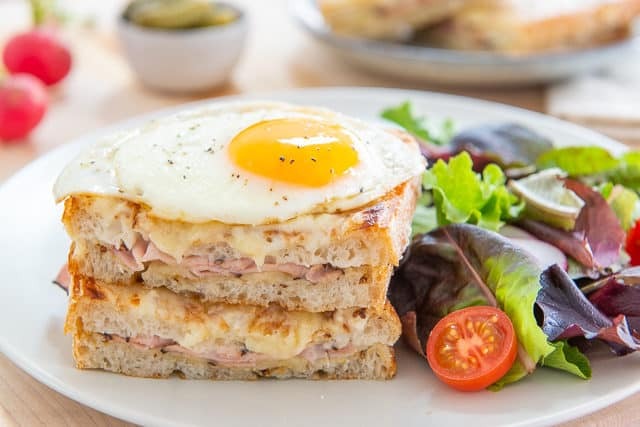 Crusty bread is spread with a Mornay sauce and Dijon mustard, stuffed with ham and gruyere, and topped with a fried egg. I’m pretty sure this is my favorite sandwich ever. I had an absurd number of croque madame sandwiches while I was in Paris, considering all of the food choices that I had while I was there. I just couldn’t stop eating them. And if you’ve ever had one, you know why. Each eating component has many layers to it. For example, this sandwich is not just crunchy. 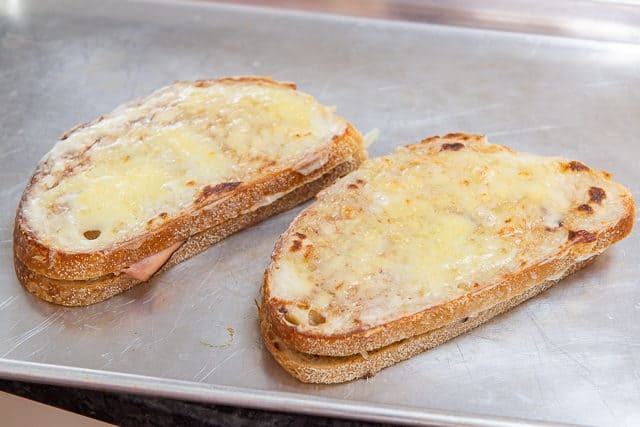 Because the Mornay sauce soaks into the bread and goes under the broiler for a few minutes, it gives it a rich and gooey interior as well, not to mention the melty texture of the Gruyere. 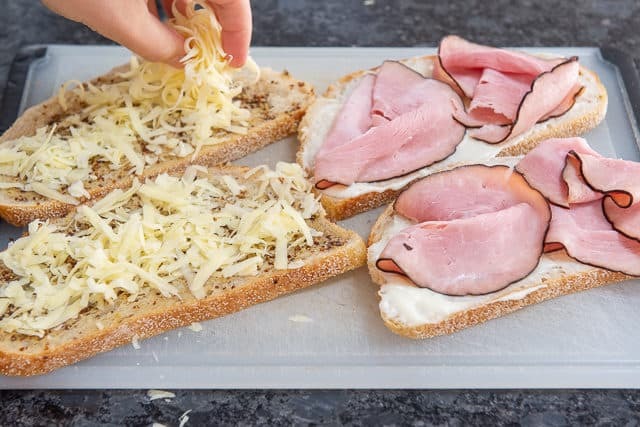 And the slight sweetness of the meaty ham, with sharp Dijon to contrast, the nuttiness of the Gruyere, the creaminess of the Mornay…it’s all so magical together. Even though it sounds like a lot is going on, it’s really not time-consuming or hard to make. Give yourself 20 minutes in the kitchen, and you’ll have a big platter full of hot sandwiches to enjoy by the end. A big part of the croque madame is a creamy Mornay sauce that soaks into the bread. 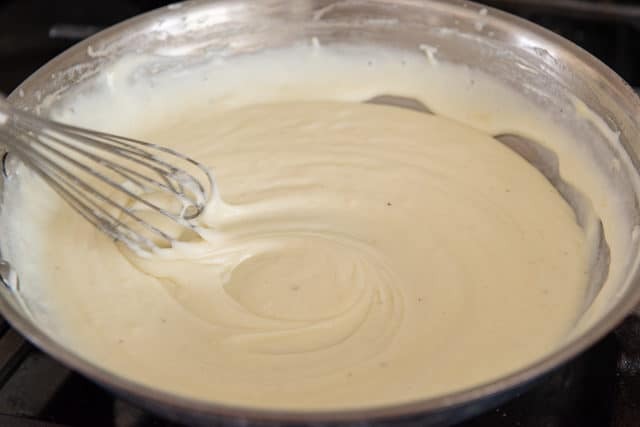 What is Mornay Sauce? It’s basically just a bechamel sauce with gruyere added at the end. It’s simple to make and takes less than 10 minutes! Now we can make the sandwiches! 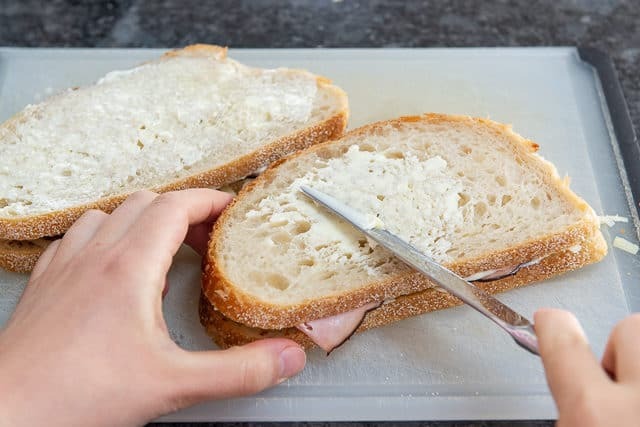 I have tested tons of variations of this sandwich over the years, and though I commonly see white sandwich bread used, I think a sturdy loaf bread like sourdough is MUCH, much better. It has better flavor and texture. Also, Dijon mustard is my favorite mustard choice for the sandwich, though sometimes I’m in the mood for a more grainy mustard. Use your favorite. For the ham, my preference is Black Forest, but other types will go nicely too. 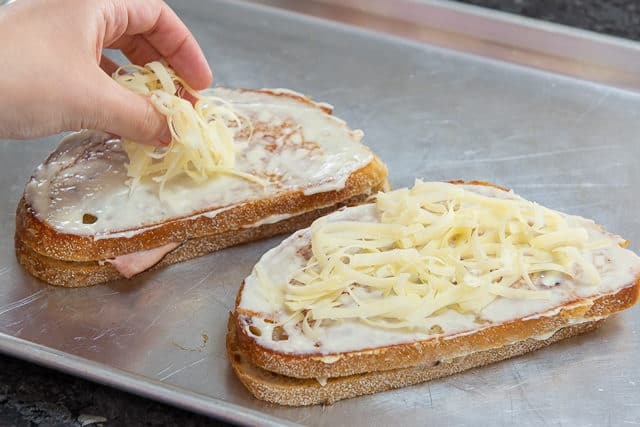 Transfer the crisp sandwiches to a baking sheet, and spread the tops with more Mornay sauce. 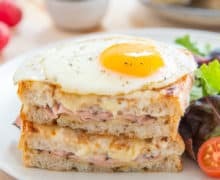 I love dipping the sandwich into the runny yolk, but this sandwich is plenty outrageously delicious as just a Croque Monsieur if you feel like skipping the egg altogether. Something light is nice to have on the side, like a simple mixed greens salad with Lemon Vinaigrette or Balsamic Vinaigrette. The sandwich is quite rich. Enjoy! 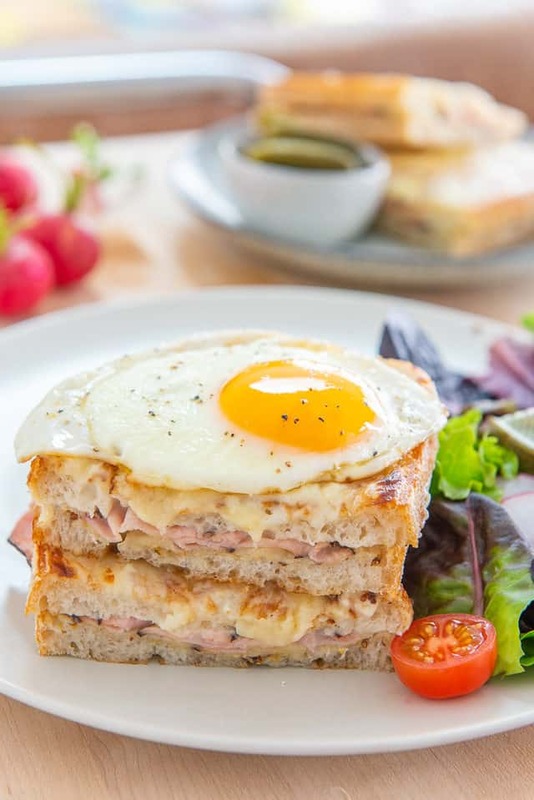 For this delicious French sandwich, sourdough bread is spread with a mornay sauce and Dijon mustard, stuffed with ham and cheese, and topped with a fried egg! In a medium skillet, melt the butter over medium low heat. 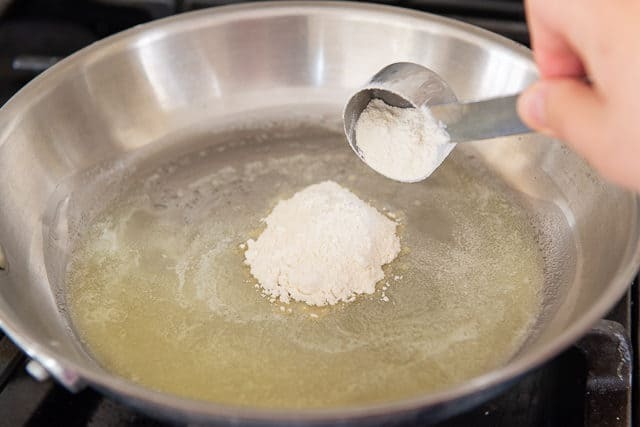 Add the flour and whisk until a smooth, blond paste forms, about 30 seconds. 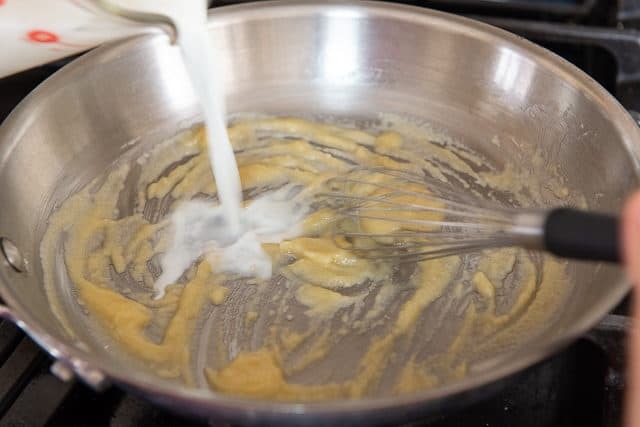 While whisking, add 1/4 of the milk to start. 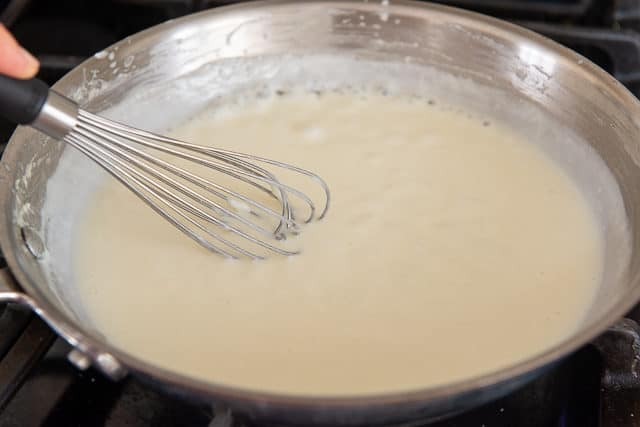 Whisk until smooth, then gradually add in the rest of the milk, to minimize clumping. Bring to a boil, then reduce to a simmer and cook for 1-2 minutes, until the sauce thickens. 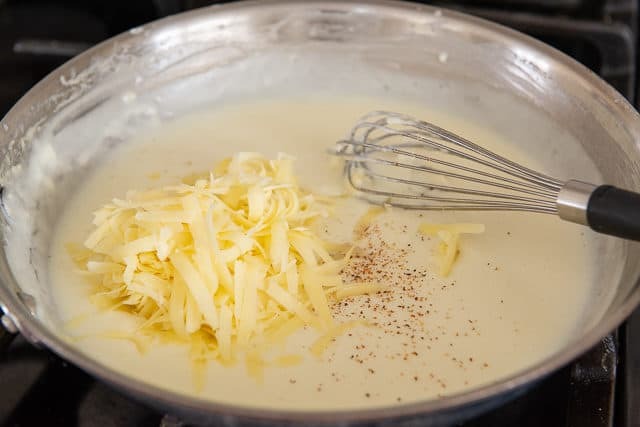 Remove the pan from the heat, then whisk in the gruyere, nutmeg, and 1/4 tsp salt, until smooth and gooey. Taste and add more salt, if necessary, then set the sauce aside. For each sandwich, spread one slice with mornay sauce, and the other slice with Dijon mustard. I like about 1.5 tbsp of Mornay per slice, and 1.5 tsp of Dijon per slice, but no need to be exact. Add a few slices of ham to one of the bread slices, and about 1/4 cup of shredded gruyere to the other. Put the bread slices together to form sandwiches, then spread the outsides of both pieces of bread with softened butter, about 1.5 tsp each, but again, no need to be exact. Heat a nonstick frying pan over medium heat and cook the sandwiches on each side for 2-3 minutes, until golden brown on each side. Remove the sandwiches to a sheet pan, and preheat the oven broiler to high. 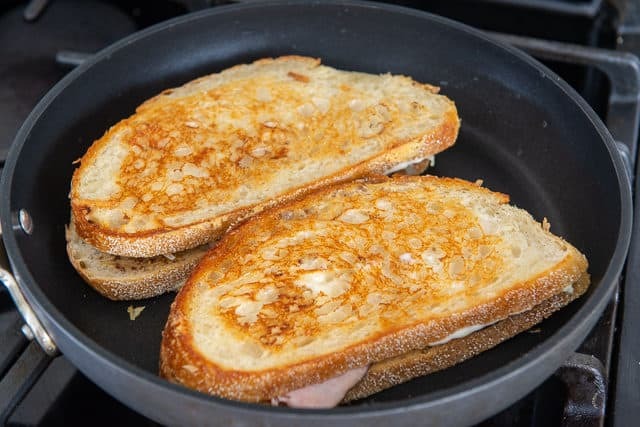 Spread about 2 tbsp of mornay sauce onto the top of each sandwich, and broil until the tops are golden brown and bubbly, and the sauce has seeped into the crispy bread, about 2 minutes. 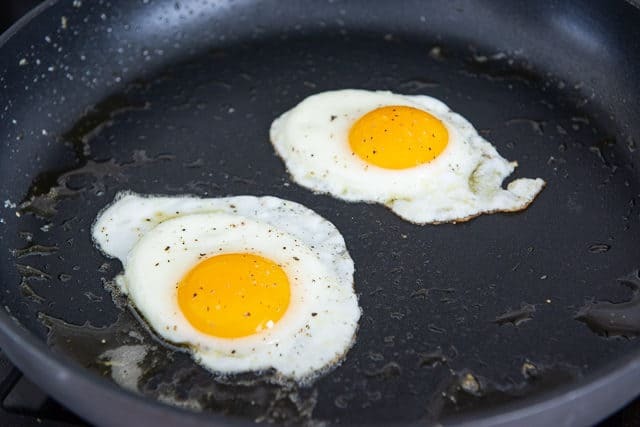 Fry the eggs in the same frying pan that you grilled the sandwiches with, making sure to season them well with salt and pepper, until the white is set but the yolk is still runny, about 2 minutes. Top each sandwich with a fried egg, then enjoy while hot! There's enough mornay sauce here for 4 hefty sandwiches, and you could possibly stretch it to 6. Also, you can choose to make only 1 or 2 sandwiches at a time, and keep the leftover mornay in the fridge for making additional sandwiches another day. Post updated in March 2019. Originally published July 2011.